It’s a wild political time. The U.S. is preparing for November’s impending election, the United Kingdom recently voted to leave the European Union, and other nations are watching to see what those outcomes will mean for the global economy. But you know what? I’m optimistic. Because the world is about to be run by women entrepreneurs. So much already has been accomplished by and for women and girls. Now, we have powerful new tools and xperiences that point us to what more we can do. Multiple summits unite leading voices. This was one of my many takeaways from The United State of Women Conference (USOW), hosted June 14 in Washington, D.C. The conference united approximately 5,000 women leaders to launch the #StateofWomen movement. The initiative tackles pay equity, workplace leadership, and a woman’s right to take charge of her own body. I invite you to join me and First Lady Michelle Obama in taking the pledge here. You’ll be in the company of designer and philanthropist Tory Burch, Pepsi Chairperson and CEO Indra Nooyi, U.S. Chief Technology Officer Megan Smith, and noted actress Kerry Washington. Together, we can make a difference. How? By advancing the conversation, we inform world leaders through data and champion policies that help women scale their businesses. During last week’s Global Entrepreneurship Summit, more than 700 entrepreneurs, 200 investors, and 100 world leaders converged at Stanford University to talk about many of these same issues. Women and youth were a primary focus. WE Cities project analyzes local-level support. Dell’s 2016 Dell Women Entrepreneur Cities Index (WE Cities) served as a springboard to help launch these discussions. The dialogue highlighted the unique challenges women entrepreneurs face. But with every challenge, an opportunity presents itself. Our WE Cities Index measures a city’s ability to attract and support high-potential women entrepreneurs whose businesses will help create the 600 million jobs we’ll need in the next decade. Focusing on the city level enables us to assess the impact of local policies. We examined each metro area’s capital, technology, talent, culture and market characteristics. 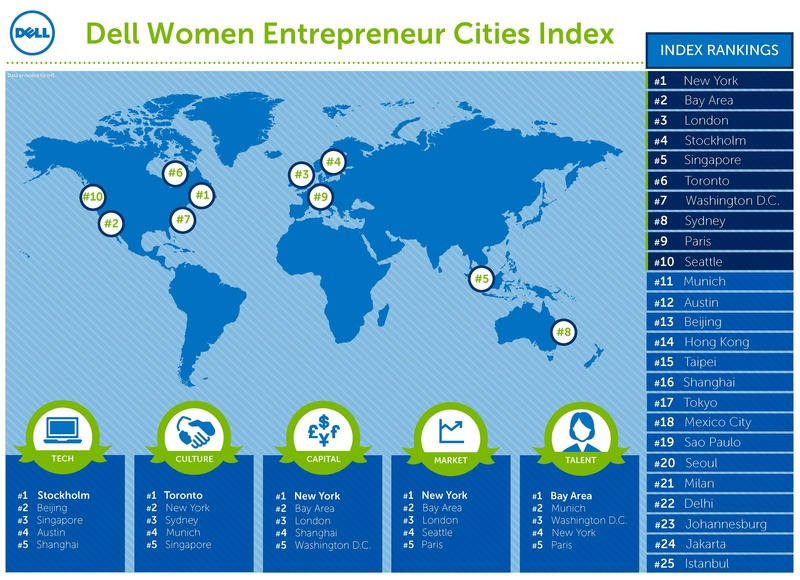 Then, we graded cities on a scale of 1 to 100, based on how well a woman could start and grow her business there. New York City ranked No. 1, ahead of Silicon Valley. We believe this reflects the region’s male-dominated tech fields and illustrates the need for public- and private-sector support of STEM education for girls. Toronto, Paris and Sydney are cities to watch. While they aren’t traditionally considered hotbeds for entrepreneurship, all three have women-friendly policies that make it easier to continuing running a business after having a child. The highest-ranked city scored 59/100, showing there’s a lot of room for improvement. And that’s the purpose behind our research. It’s great to know where a city ranks, but our intent is to give policymakers and city leaders access to our findings so they can address weaknesses and build on strengths. Partnerships can foster real policy change. This week marks the seventh Dell Women’s Entrepreneur Network (DWEN) Annual Summit in Cape Town, South Africa. There, we’ll enlist the power of our global network to get even greater numbers of women involved. It’s time for us to engage politically. It’s the only way to assure the right ecosystems are in place for women in business to scale their plans. Partnerships among politicians and entrepreneurs can foster dynamic policies that complete the circle, enhancing the process from idea to enterprise.